Matt C: Finally. FINALLY! You'd be forgiven for thinking Matt Fraction and David Aja's volume of Hawkeye had already come to an end, given the length of time since the last issue (5 months! ), as well as the fact that Jeff Lemire and Ramon Perez already have three issues in the can of their All-New Hawkeye series and a gearing up to launch another volume later this year featuring a very different iteration of Clint Barton. But no, there was one more issue left to go, and this Wednesday that issue finally appears. But lets leave any cynicism at the door because the increasing delays won't matter once the whole thing gets collected and consumed by those who don't do monthlies - what they'll see, and what we'll be reminded of, is how Hawkeye unexpectedly became arguably the best solo series Marvel has put out this decade (and a hugely influential one at that). Let's celebrate that because it is series that should still be celebrated even if it may have dropped off the radar in recent times. Other than that it's a quiet week for me with - shock-horror - no Image comics all my pull-list (can't remember the last time that happened!) With that in mind, I might take a look at the Secret Wars tie-in Hail Hydra #1 which I'm guessing will be Rick Remender's last book for Marvel (for the time being, at least). I'll be sad to see him go after the high points of Uncanny X-Force and the first volume of Uncanny Avengers but if it means more books like Black Science, Deadly Class and Low will be on his slate, I can't really complain! Kenny J: Perusing this week's releases I had to do a double take when I saw Hawkeye #22 among Marvel's offerings. To be honest, I had completely forgotten this was out there in the publishing schedule wilderness but that existence and the fact it will be on our local comic book store shelves this Wednesday - finally bringing Fraction and Aja's run to a close - has me excited. 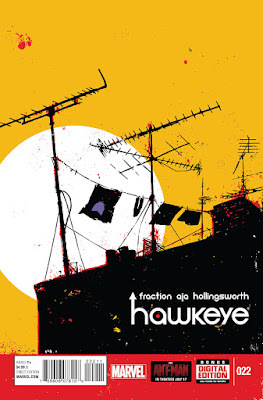 Hawkeye is a character in the ascendance for me, both on the page and the screen, and, though I am enjoying the concurrent series, the previous team produced one of my favourite idiosyncratic titles of recent years. I'll be sad to see it go but looking forward to see how it ends. I'm not an avid follower of Godzilla or the multitude of books IDW put out starring the giant lizard, however, a couple of years ago James Stokoe's art was enough to entice me into reading Gozilla: The Half Century War, which I enjoyed very much. Now we are getting another Godzilla book with the writer-artist's name attached, Godzilla In Hell. As the title suggests, it will be monster versus monster as each instalment sees the reptilian goliath face off against the hordes of the underworld. Alas, Stokoe will only be delivering the initial issue as each subsequent one will feature a different creative duo. Thankfully Stokoe is sure to help make a decision on whether to continue reading after his contribution. Otherwise it's a quiet week, with only the sublime Trees from Image making up my regular reading, meaning I'll be taking a closer look at some of those Secret Wars tie-ins. It's choice of three. Rick Remender's final foray into the world of Captain America brings us Hail Hydra #1. It won't be Steve but his adoptive son, Ian Rogers, infiltrating Hydra in their very own battleworld. Guardians Of Knowhere #1 and Captain Britain And The Mighty Defenders #1 will also be getting the first issue test this Wednesday.